Lisa Rosado, a first-year from Puerto Rico, woke up in her dorm room on September 19 thinking it was going to be a typical day. She later realized it was far from it. At breakfast, Rosado took a look at the TV screen. It caught her attention that the news anchor was presenting the path of Hurricane Maria, which was going to affect Puerto Rico. Strong winds reaching 155 mph and heavy rainfall began to lash over Puerto Rico at 11:15 a.m. that day. At that same time, Rosado was about to start class when she began seeing more updates about the hurricane. Rosado recalls not knowing how to respond to the tragic event. It seemed like her world was coming down on her. Hurricane Maria was named the tenth most intense Atlantic hurricane on record, with sustained winds reached their maximum at 175 mph. Hurricane Maria took the lives of 88 people. “I knew Puerto Rico would suffer a lot,” said Rosado. Puerto Rico had already been impacted greatly by Hurricane Irma, leaving the country without power and water. “I was scared that it would be a long time before they got power and water back,’’ said Rosado. Rosado has family and friends living across the island. She was devastated that her beautiful island was going to get destroyed by such a powerful hurricane. In Puerto Rico, Rosado’s family lives in a two-story house. Due to heavy rainfall, the house flooded up to the first floor. Next to their house, the Rosado family had a breadfruit tree that was uprooted by the hurricane. The Rosado family cherished that tree deeply because they used the fruit the tree provided to make all sorts of different dishes. The way Rosado most enjoyed the breadfruit prepared was in a fried dish made by her mother. The Rosado family also lost a storage warehouse during the storm. Back in Puerto Rico, Rosado was involved in music classes, voice lessons and sports such as volleyball, basketball and Ping-Pong. Being involved in such things made her very busy and left little time to be at home. Currently living on Goshen College campus, it is hard for Rosado to be so far away from her family. To help her cope with the pain, she attended a convocation that dedicated most of the time to prayer for the victims of the natural disasters that were taking place around the world. “Being so far away from home, I think too much about whether they are okay and safe,” Rosado said. 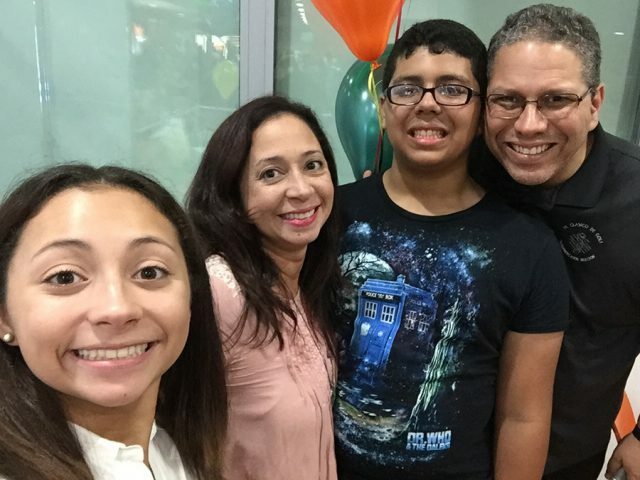 Due to the long distance, Rosado is limited in the help she can provide, but she is committed to buying and sending the supplies that her family and friends may need. Although the phone signal is not good due to the hurricane destroying most of the cable posts, Rosado is still able to keep in touch with her family. Rosado struggles to keep her family off her mind and has had a hard time focusing on school in the midst of this situation. She has tried to stay busy and involved, especially with choir. Rosado hopes that the situation in Puerto Rico will continue to improve. She is very thankful that the clubs at Goshen College have been contributing to gathering donations to send to the affected ones in Puerto Rico. As of the last time she heard from her family, they are back in their home which they have cleaned and restored.